The VST product line has grown from the original 41' working height VST 3600 all the way up to 80' working height (the new VST 7500). These machines are all available with or without material handling. The new hydraulic extending and elevating winch and jib make for an awesome material handling system. Axle loading on these machines is relatively light and the trucks don't have anything protruding beyond the front or rear bumpers. Even the 80' VST 7500 can be built on a single rear axle chassis NON FET. Crews love the extra payload and increased maneuverability. 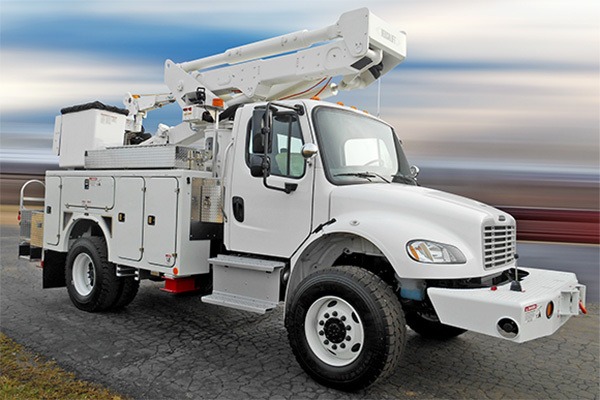 The VST product line has reshaped what a traditional, big bucket truck should look like. The VST-40 (45’ working height) has been a mainstay of the Versalift product line for nearly two decades. It can easily be mounted on a a class 5 chassis with plenty of payload left over. The boom only requires one set of A frame outriggers for stabilization with no need for counterweight or ballast. There are a number of platform options ranging from a single 24” X 24” to the extra wide 24” X 42” or the aluminum 40” X 64” aluminum platform. The winch and jib feature is offered in three different varieties with up to 1, 000# of material handling capacity. Maximum Platform Capacity: 600 lbs. The Versalift VST-TN series lift has features that make it great for sign and lighting maintenance. 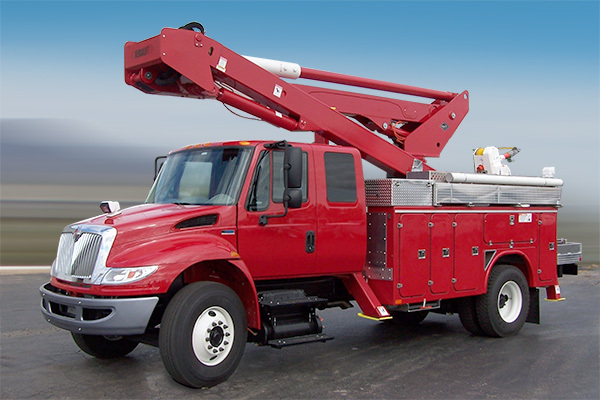 A boom with up to 60' of working height can be mounted on a non-CDL Chassis. 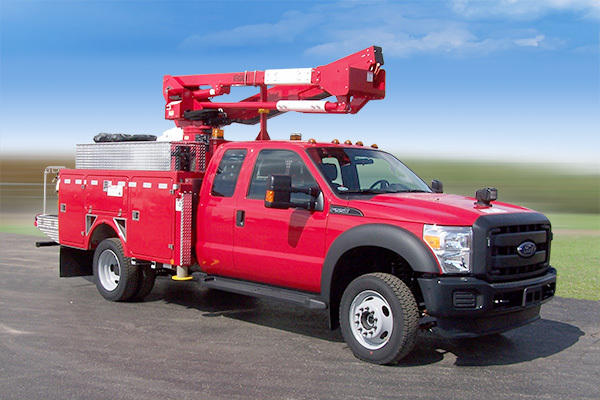 From 44' to 60' of working height mounted on a typical F550 Super Duty chassis. 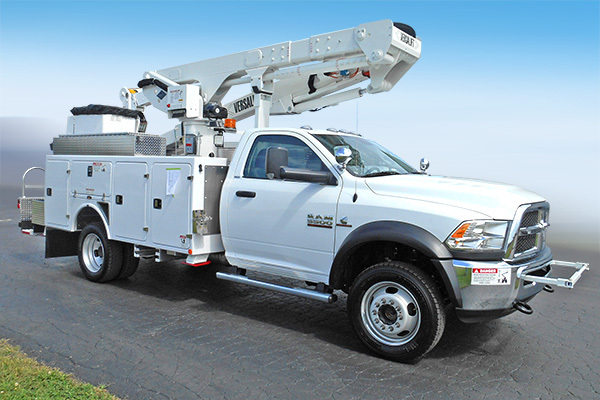 This articulating / telescopic type aerial device has tremendous side reach ( up to 30'-7") and stows on a short wheelbase, non-CDL chassis. The VST-47 is a revolutionary design that incorporates the reach of a large boom with the maneuverability and convenience of a class five chassis. 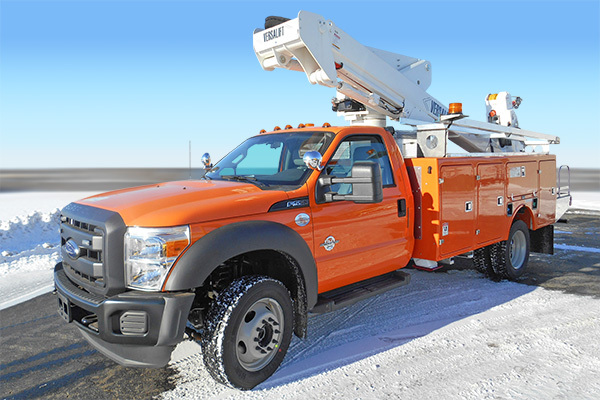 With over 51' of working height and 31' of horizontal reach, this aerial device on a 19,500# chassis is in a class of it's own. The material handling jib has 1,000# capacity with a single-man bucket. 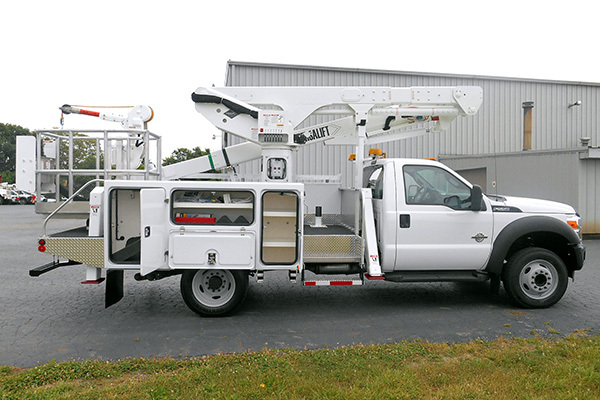 Max Working Height: 51' 6"
Max Horizontal Reach: 30' 10"
The VST-5000 is the workhorse of utility vehicles—robust yet remarkably versatile. Its articulated/telescopic booms allow access to work in tight areas, and is fitted with two sets of 'A' frame outriggers for premium stability. Its boom configuration allows long reach underneath service wires, up driveways and into other seemingly difficult places. Horizontal Reach: 36 ft. 8 in. Offers 55' of working height and 1,000# of material handling capacity. The unit fits well on a the above pictured Freightliner (or IH) with a short 84" cab to axle. This short wheelbase truck typically weighs only 12,500# on the rear axle with a fiberglass body. Boom does not protrude beyond the front or rear bumpers. Crews love safe bucket access off of the floor of the bed with no need for dangerous bucket steps on top of the body. Many clients from a variety of industries are very pleased with this lift. The Versalift VST-6000 is the only telescopic articulated bucket truck to provide 65 feet of working height on a 108 inch CA chassis. This original compact design allows both the height to take on almost any size pole, and a smaller footprint that allows you to work in tight areas. Horizontal Reach: 38 ft. 9 in. 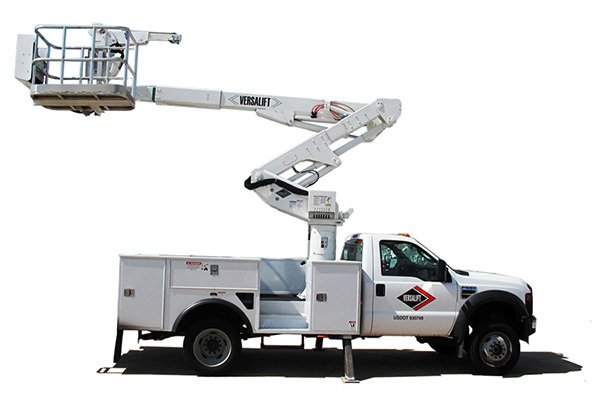 Offers 65' of working height and 1,000# of material handling capacity. Maximum Platform Capacity w/ Option Jib Installed: 500 lbs. Maximum Jib Capacity (Optional): 1000 lbs. The VST 6300-7500 Series insulated lifts provide both additional bucket and material handling capacities. With up to 800# in the bucket along with 2,000# on the material handling winch and jib, these units offer extraordinary reach and power. All of these models can be mounted on single rear axle trucks, which can make them very cost effective as well. Horizontal Reach: 46 ft. 10 in. 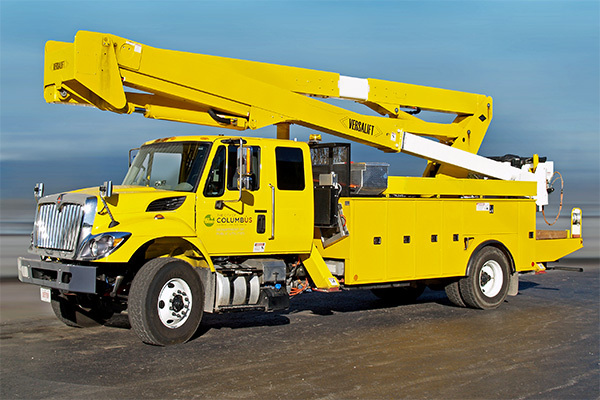 Offers 80' of working height and 2,000# of material handling capacity. Maximum Platform Capacity: 800 lbs. Maximum Platform Capacity w/ Option Jib Installed: 700 lbs. Maximum Jib Capacity (Optional): 2000 lbs. Lower Boom Lift Eye Capacity (Optional): 1500 lbs. The unique and customizable design of the Versalift SST-37/40 ensures that you receive a quality-engineered product that meets your industry-specific needs. Each model can be further customized to include a variety of options that enhance the overall capabilities of the unit. 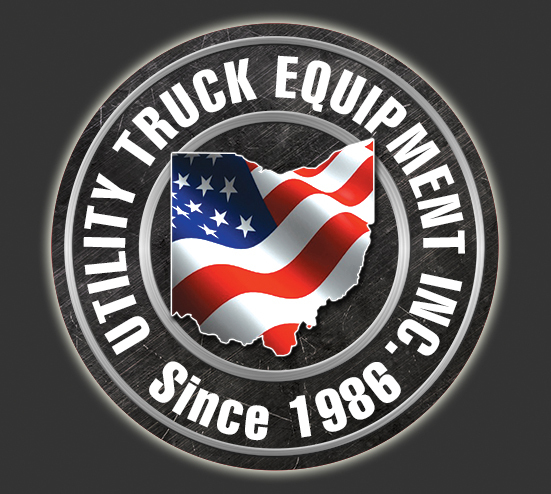 UTE uses a variety of chassis models for mounting new Versalifts; we custom design our utility bodies to your specifications. Our sales force can guide you with the proper specifications.